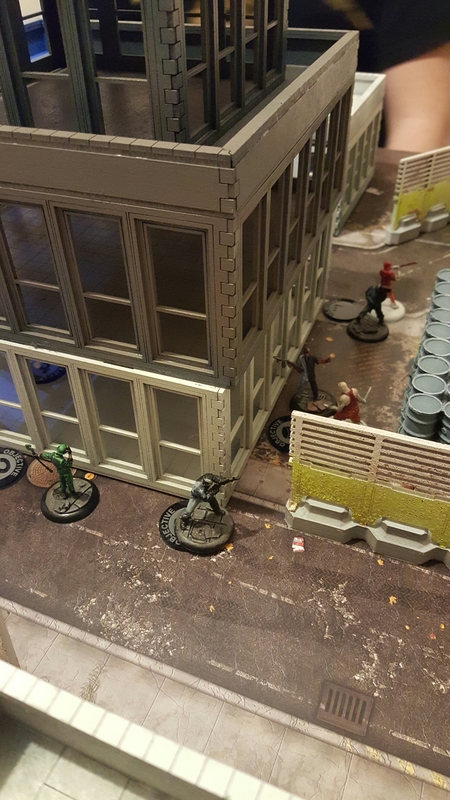 2nd game of Batman yesterday and great fun it was too. We played scenario 1 again but this time used all the rules for objectives and money. With 2 crews on the board there was a lot more room and fewer sewers and lamp-posts. In the first turn the two crews were scatterered around the table but were well spaced. Most of the turn was spent closing on objectives. 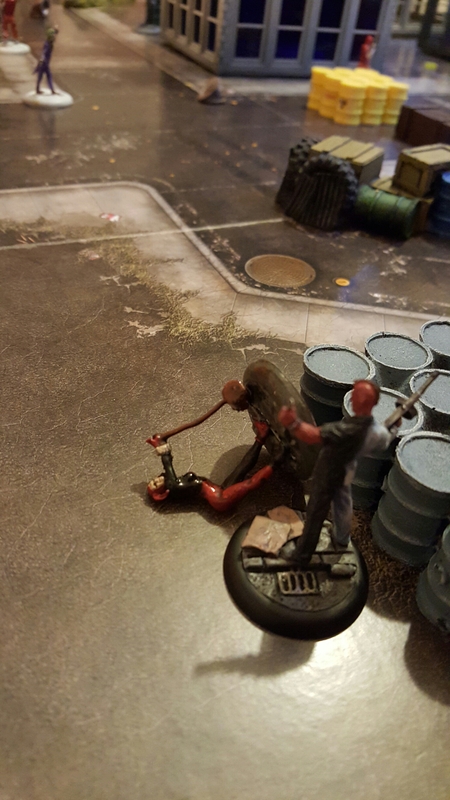 One of the Two-Face henchmen didnt start on the table but this gave him the chance to deploy behind the Joker in turn 2. I was lucky enough to take the lead this turn so he rushed in hoping to put some damage on the opposition boss. Unfortunately he was not successful, but he did succeed in distracting the Joker and Harley for a couple of turns. Meanwhile in the middle of the board there were a number of interesting face-offs developing. 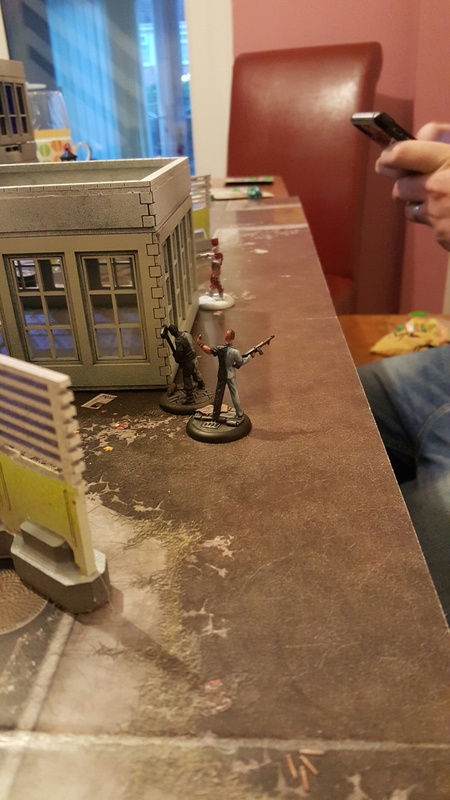 At this stage I was trying to get Two-Face and his machine gun henchman onto objectives where they might make good use of their guns. In the first game they had been very effective but we had played ROF rules incorrectly by always giving the full ROF even having moved. This time I had the challenge to set up shots without moving to get the full 3 shots. In addition the Riddler was moving around trying to solve the riddle objectives. The action in the centre of the board was fairly brutal. However, as in the first game we found that the models are pretty resilient unless ganged up on. This is not an alpha strike game like Warmahordes or Infinity; it’s more of an attrition affair. 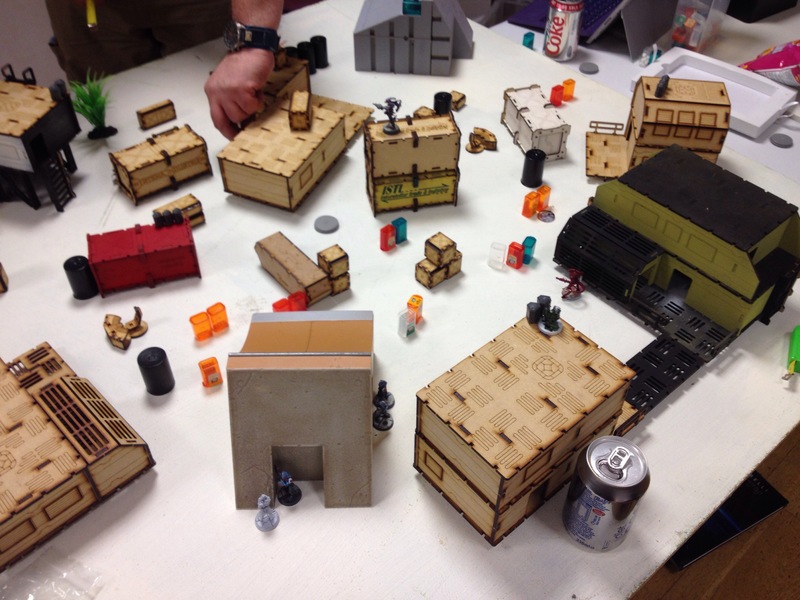 What was also much more obvious this time was the pressing need to get models on your objectives and keep them there to rack up the VPs awarded at end of each turn. 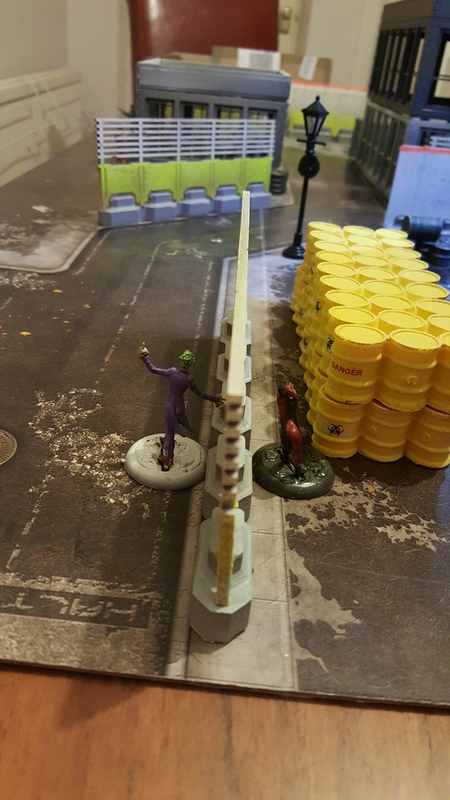 In the final stages of the game it was looking like the Two-Face Crew would take the win. 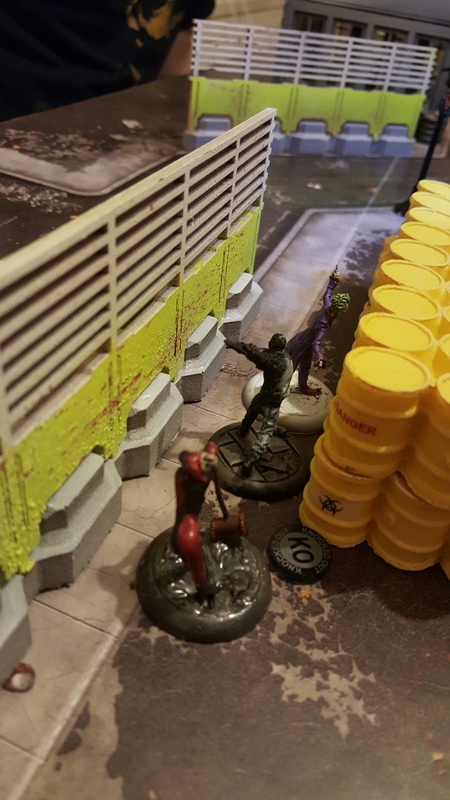 They had camped on a couple of objectives to good effect and the Riddler had solved a couple of riddles. However, the Joker had the last laugh. 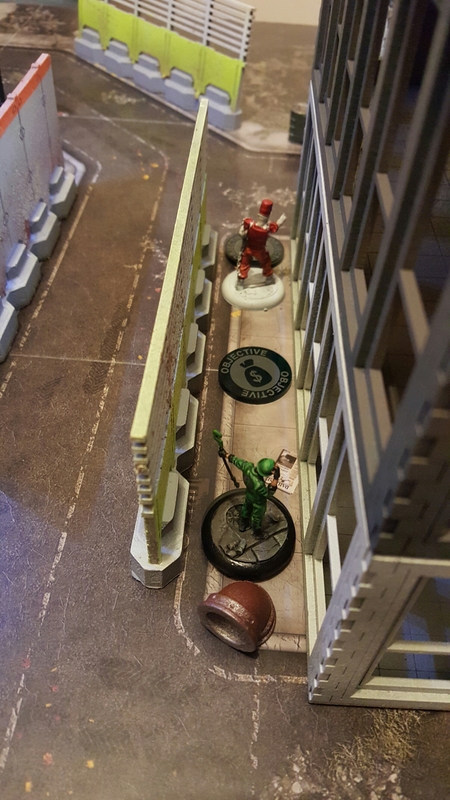 Using his Explosive teeth he was able to take a chunk out of the Riddler, remove my henchman from an objective and secure an objective himself. 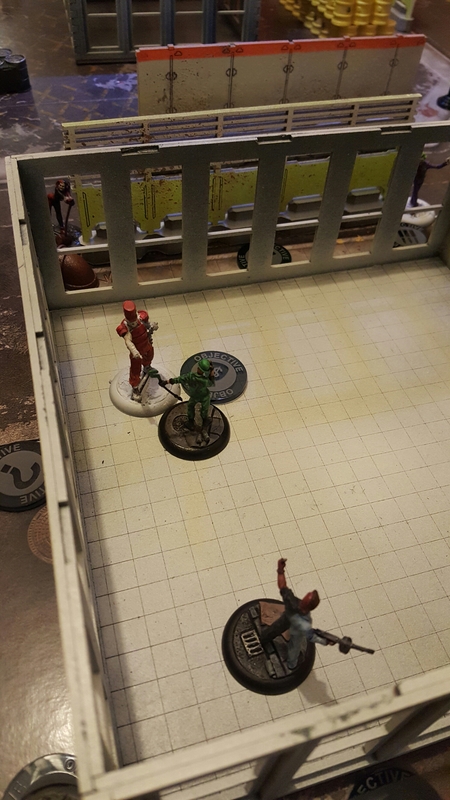 Harley Quinn and the Ringmaster also came into their own knocking out both the Riddler and Two-Face. If I had enjoyed some better luck with my recovery rolls I might have held on for a Two-Face win, but it was not to be. Nail-biting stuff and great fun. I remain impressed with the game and their is a lot more depth to explore. The biggest error I made was trying too hard to get Two-Face into a good firing position rather than taking a few shots here and there to whittle down the Joker crew. In fact Two-Face didn’t fire his gun at all! I quite liked the Riddler for VPs but he was a bit squishy for the points and had little impact on the other crew. I think next time I’ll concentrate on Two-Face and his henchmen and try and make better use of his shooting game. Dodgy dudes! Anyway, the table set-up is similar to what you might find in Infinity: plenty of raised areas and ample scatter terrain to give cover. 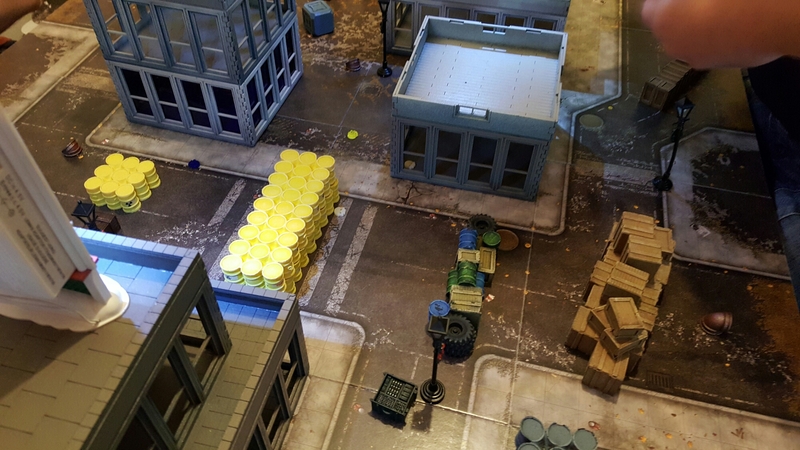 In addition a number of lampposts and sewers are placed which act to illuminate areas of the board and as tunnels for hiding/fast movement respectively. 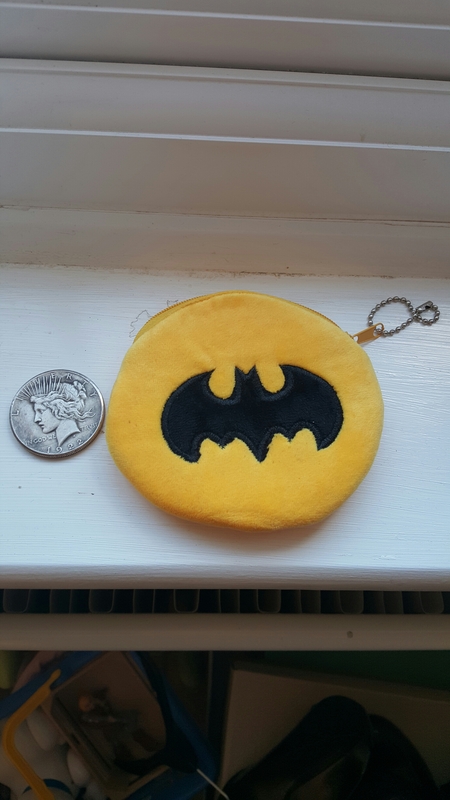 This is something unique to the Batman game (as far as I am aware) and rather cool. Joining Two-Face and Poison Ivy was a Joker crew for a three way scrap. 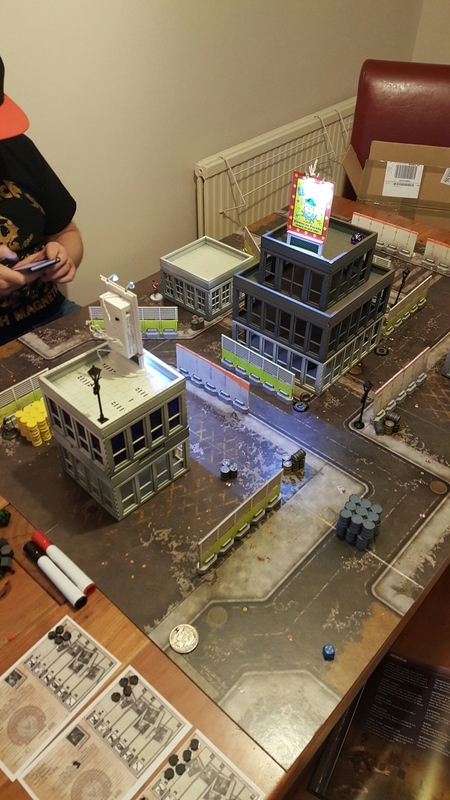 We played the first scenario pretty faithfully to what’s in the book but decided to use just loot counters for objectives and play to 10VPs. 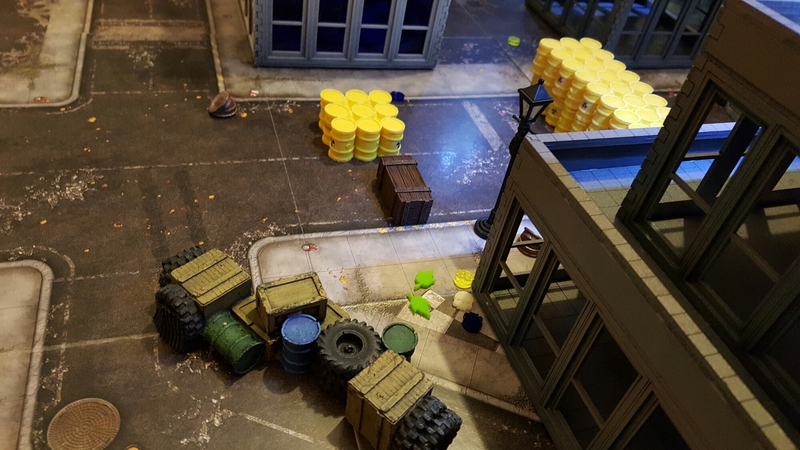 Deployment was semi-random which made for bloody action right from the start! The mechanics of the game are quite straight-forward but there are lots of special rules and effects that make the game play interesting. After a couple of turns we found that it’s actually quite difficult to take a model down unless you focus a lot of effort on it. It’s certainly a more forgiving game than WarmaHordes or Infinity in that respect. We did find that you need a lot of tokens for the game. In the main these are placed on the cards that go with the models, and there is a lot to keep track of. I’ve ordered some tokens to help with this and printed and laminated the character cards so they can be written on too. 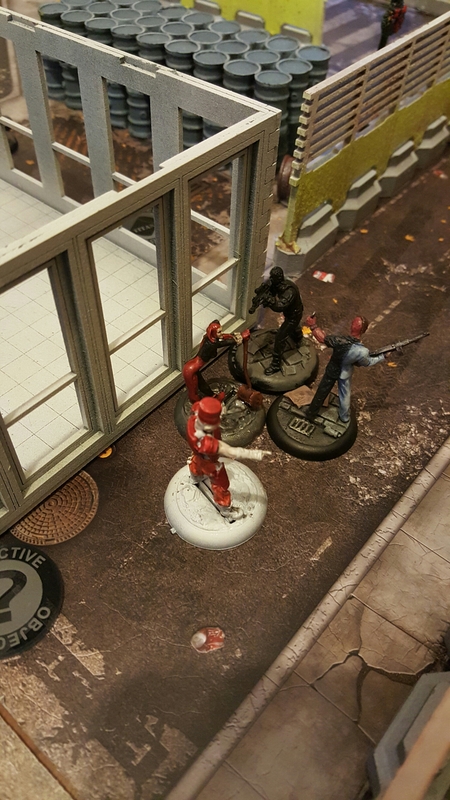 In the game itself Two-Face managed to get a good win. It was his machine gun that really made the difference and he is a pretty tough cookie to boot. The Joker seemed to have a lot of sneaky characterful rules that made him interesting while Poison Ivy’s ability to take control over opposing models make both of these other gang leaders viable and fun choices. We picked up the rules quickly and only came across a small number of difficulties. It was a good night’s gaming that left me wanting more. In conclusion I would say this is a very cinematic and characterful game with a well designed rules engine. 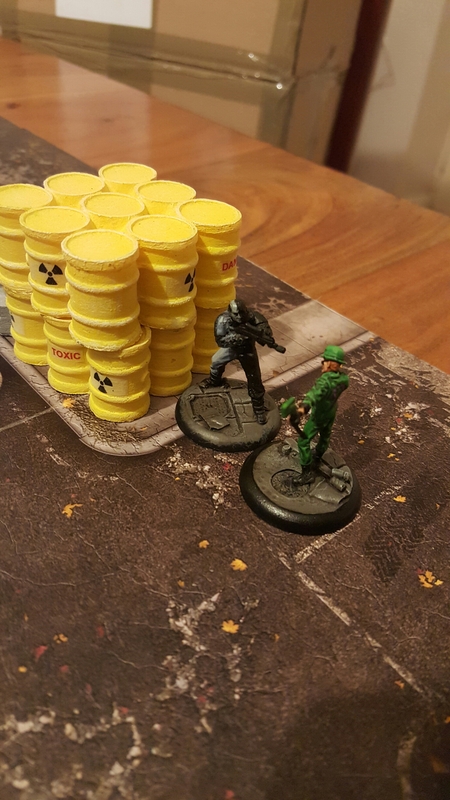 The miniatures are nice and there is depth in the game play that make this more than just another throwaway skirmish game. I would say it shares some common ground with both Eden and Infinity. In fact it sits somewhere between the two being not overly simplistic or complex which arguably are downsides of those games. I’m impressed and looking forward to playing more. Hmmmmm. So, back to the Combined Army and back to horrendous dice and another shocking defeat this evening. We were playing scenario 4 from the book with the Nimbus zone. I decided to take a Charontid as Lieutenant with a Skiaviros hacker, Yaogat sniper by my usual Shrouded, Malignos combo and a handful of Morat cheer leaders. We spent a long time setting up a good table of scenery taking care to have cover at the 12 inch line and limiting sniper nests. We also went for mainly solid scenery which helps to speed the game up. 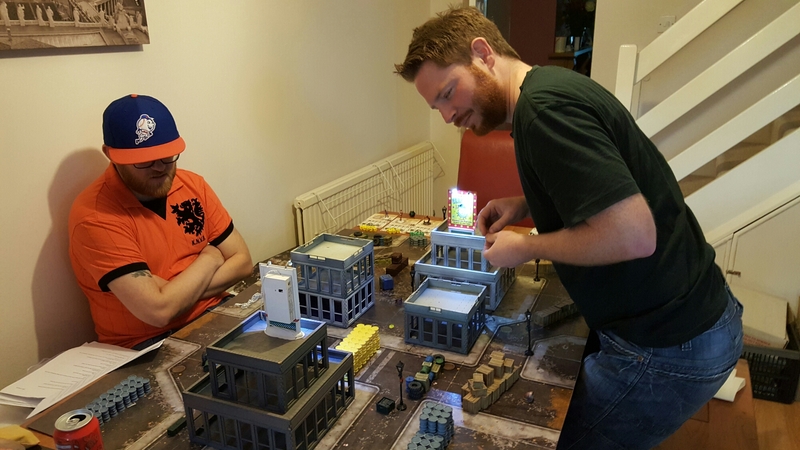 Having played Infinity regularly in recent weeks I’ve come to the conclusion that getting the table right is just as important as the game itself – well worth the effort. 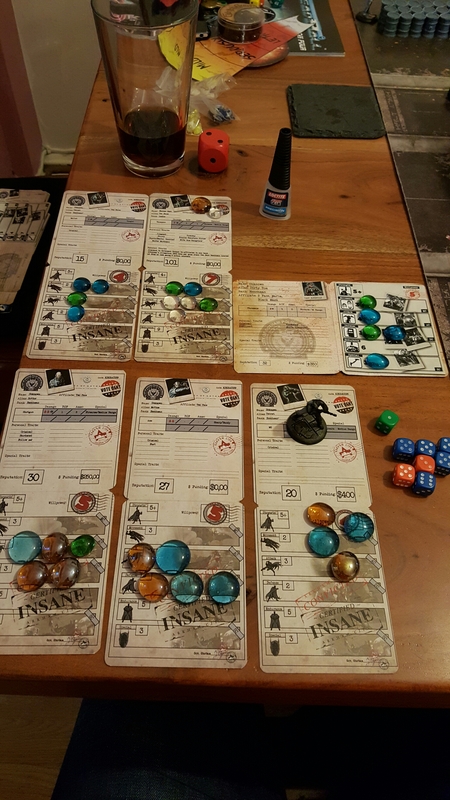 In the game itself I took first turn and made a few tentative moves forward including setting up Supressive fire with my guards through a combined order (this is proving to be a first turn must) and I managed to disable one of the Nimbus field generators. All looking good so far. The Nomads took their turn and made some moves forward themselves. A flying remote used aerial deployment to enter in the back field and target my Yaogat. This enabled another Drone to use guided weapons to take him out. A bit of pain but there was worse to come. The Nomads had a Chimera with Pupnicks who came down the centre of the board and proved to be near untouchable through a mixture of my shocking dice and hyperkinetic that gave them +9 to dodge. They wrapped up my Skiaviros and I wasted most of my next turn trying fruitlessly to take them out. In hindsight it appears that key to success was to remove the Chimera who did not have hyperkinetic – we didn’t quite play this right but damn, this is a nasty group to deal with. While this was going on the flying remote had targeted my Charontid and guided fire took it out. It was looking desperate for the Combined Army at this stage and time was running out. He called it a day with the Nomads clearly in charge. In this game I learnt the importance of covering the rear of the army. To be fair I have got a lot better at this, but my mistake was to cluster my guards rather than cover all of the backfield. I think taking two elite choices was also mistake. I only had 9 orders in the pool which simply is not enough. Finally it was a good experience facing the Pupnicks and I will be more alert to taking out the Chimera when this happens again. I haven’t painted anything for ages. Not good. Truth be known I’ve had too much on at work and there simply hasn’t been the time. When this happens I often find it difficult to get back into the habit and something a bit different is needed to get the creative juices flowing again. As it happens I have had my eye on Knight models Batman game for a while so when a chance advert on Facebook for a Two- Face gang popped up this tipped me over the edge. A friend ninjaed the rule book from Salute for me and another friend offered me a game. 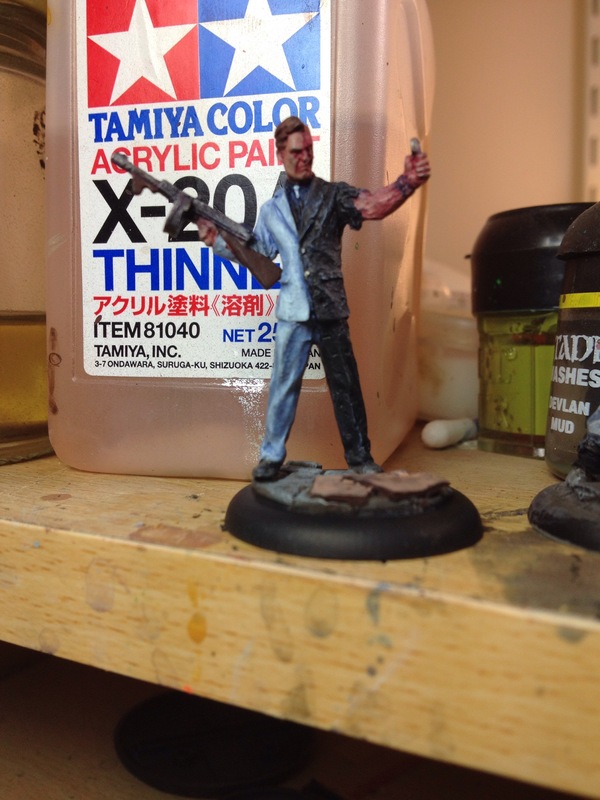 Perfect – this was just what I needed, so without further ado my work in progress Two-Faces.